The Knowstone Community Bus service is a registered bus service that operates every Thursday and runs to a strict timetable and schedule. There are two destination routes, South Molton and Barnstaple. 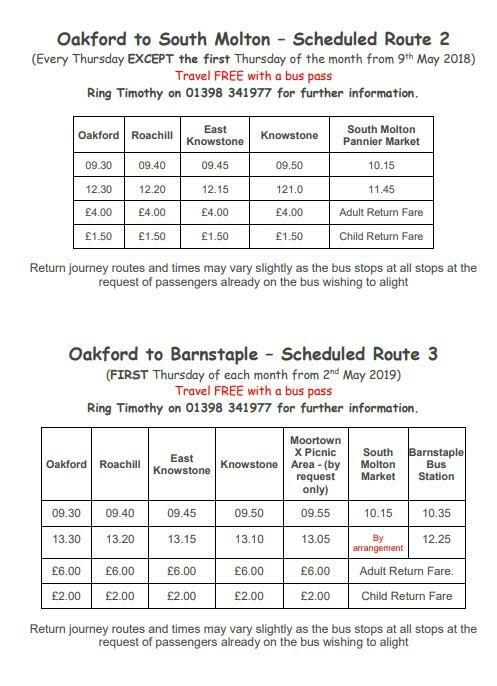 The bus goes to South Molton and Barnstaple on alternate weeks but from 2nd May will change to going to Barnstaple on the first Thursday of each month and to South Molton for the rest of the month (3 times in total). Remember - passengers with a bus pass travel FREE. The community bus service is provided by a group of local (Knowstone) volunteer drivers who are a part of the Exe Valley Community Bus committee. For details of the weekly destination please see the regular "Events" items on this web site. Bus timetable from May 2nd.